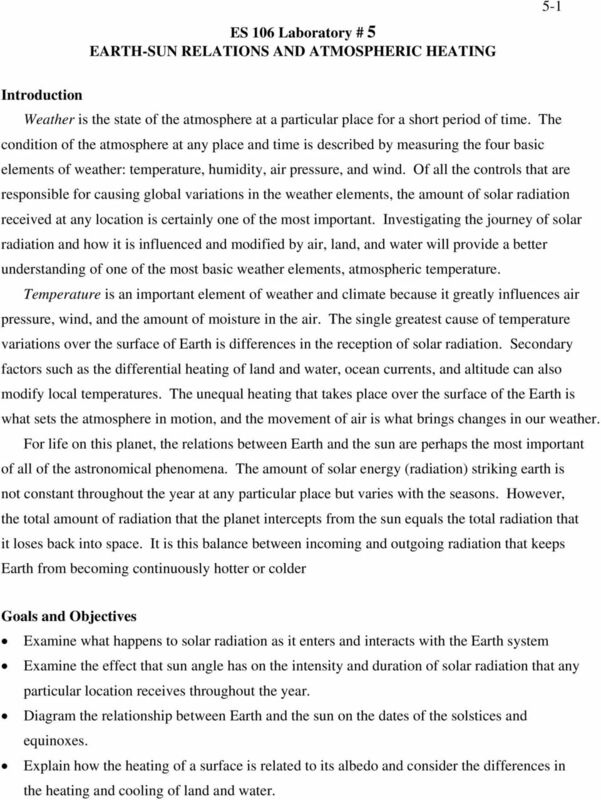 Download "ES 106 Laboratory # 5 EARTH-SUN RELATIONS AND ATMOSPHERIC HEATING"
1 ES 106 Laboratory # 5 EARTH-SUN RELATIONS AND ATMOSPHERIC HEATING 5-1 Introduction Weather is the state of the atmosphere at a particular place for a short period of time. The condition of the atmosphere at any place and time is described by measuring the four basic elements of weather: temperature, humidity, air pressure, and wind. Of all the controls that are responsible for causing global variations in the weather elements, the amount of solar radiation received at any location is certainly one of the most important. Investigating the journey of solar radiation and how it is influenced and modified by air, land, and water will provide a better understanding of one of the most basic weather elements, atmospheric temperature. Temperature is an important element of weather and climate because it greatly influences air pressure, wind, and the amount of moisture in the air. The single greatest cause of temperature variations over the surface of Earth is differences in the reception of solar radiation. Secondary factors such as the differential heating of land and water, ocean currents, and altitude can also modify local temperatures. The unequal heating that takes place over the surface of the Earth is what sets the atmosphere in motion, and the movement of air is what brings changes in our weather. For life on this planet, the relations between Earth and the sun are perhaps the most important of all of the astronomical phenomena. The amount of solar energy (radiation) striking earth is not constant throughout the year at any particular place but varies with the seasons. However, the total amount of radiation that the planet intercepts from the sun equals the total radiation that it loses back into space. 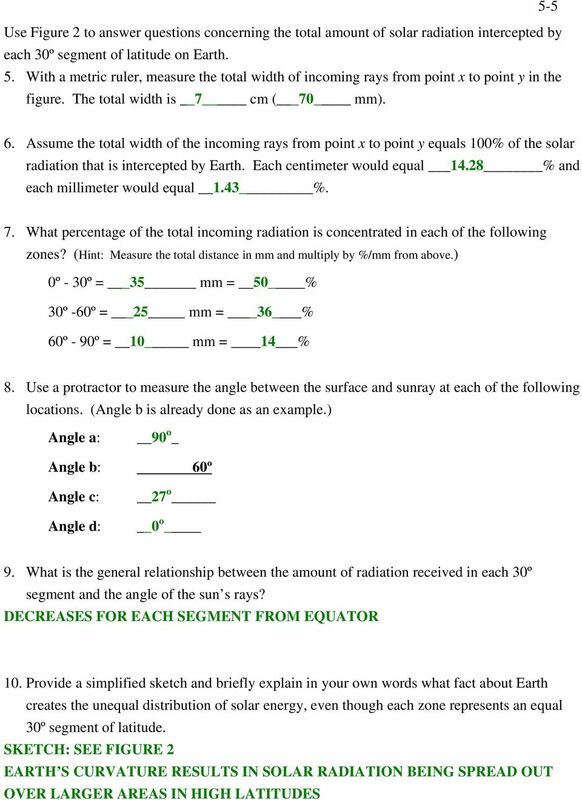 It is this balance between incog and outgoing radiation that keeps Earth from becog continuously hotter or colder Goals and Objectives Exae what happens to solar radiation as it enters and interacts with the Earth system Exae the effect that sun angle has on the intensity and duration of solar radiation that any particular location receives throughout the year. 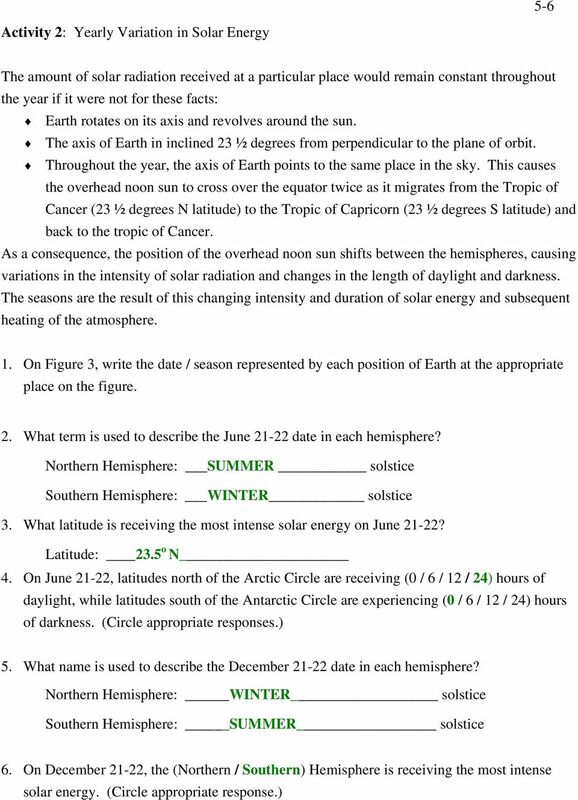 Diagram the relationship between Earth and the sun on the dates of the solstices and equinoxes. 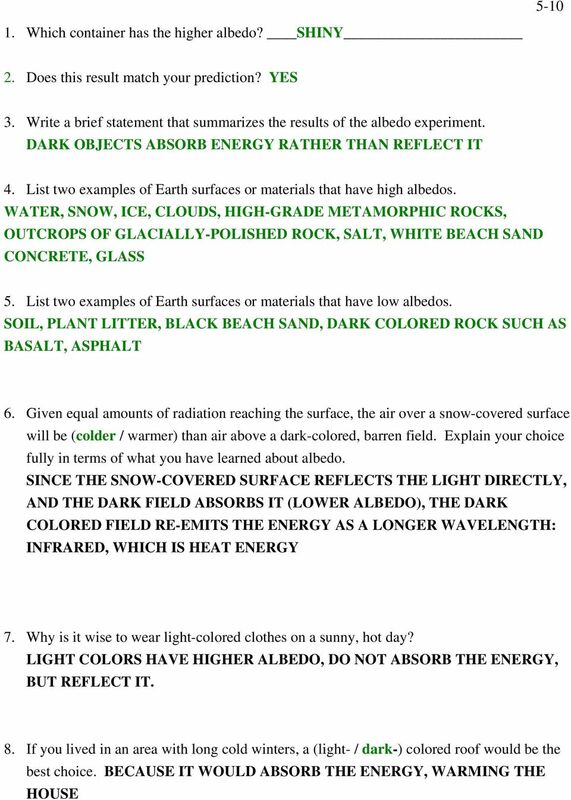 Explain how the heating of a surface is related to its albedo and consider the differences in the heating and cooling of land and water. 8 5-8 Part B The Nature of the Earth s Surface and Atmospheric Heating The various materials that comprise Earth s surface play an important role in detering atmospheric heating. Two significant factors are the albedo of the surface and the different abilities of land and water to absorb and reradiate radiation. Albedo is the reflectivity of a substance, usually expressed as the percentage of radiation that is reflected from the surface. Since surfaces with high albedos are not efficient absorbers of radiation, they cannot return much longwave radiation to the atmosphere for heating. Most light-colored surfaces have high albedos, causing light-colored surfaces (and the air above them) to be typically cooler than dark surfaces. Before getting started, predict which will have the higher albedo the black can or the silver can. 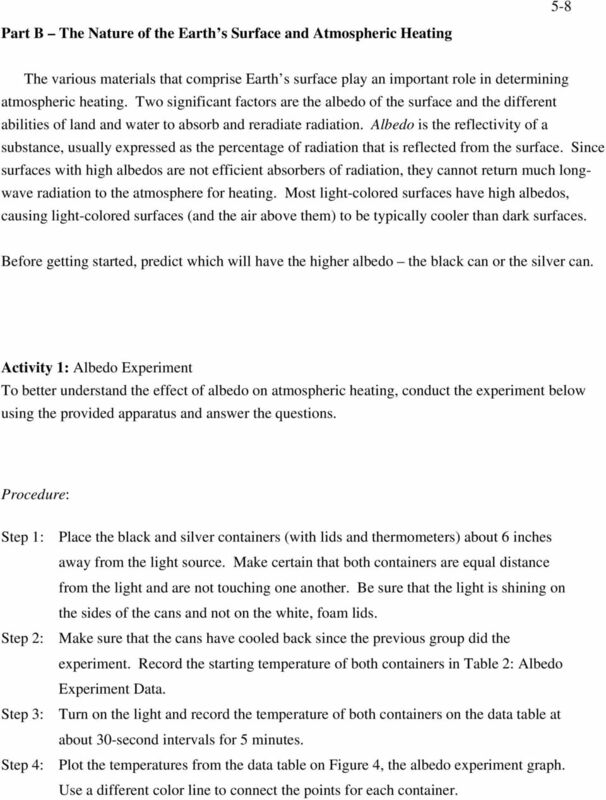 Activity 1: Albedo Experiment To better understand the effect of albedo on atmospheric heating, conduct the experiment below using the provided apparatus and answer the questions. Procedure: Step 1: Place the black and silver containers (with lids and thermometers) about 6 inches away from the light source. Make certain that both containers are equal distance from the light and are not touching one another. Be sure that the light is shining on the sides of the cans and not on the white, foam lids. Step 2: Make sure that the cans have cooled back since the previous group did the experiment. 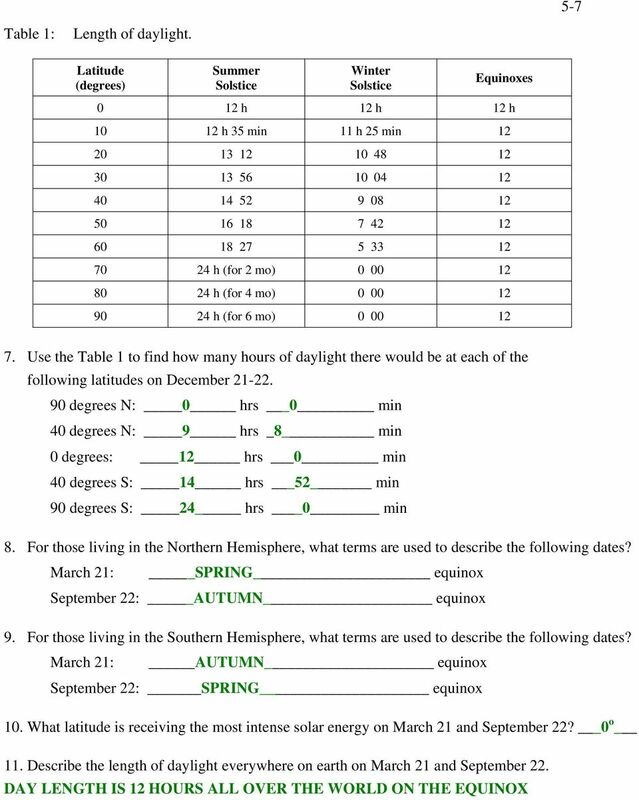 Record the starting temperature of both containers in Table 2: Albedo Experiment Data. Step 3: Turn on the light and record the temperature of both containers on the data table at about 30-second intervals for 5 utes. Step 4: Plot the temperatures from the data table on Figure 4, the albedo experiment graph. 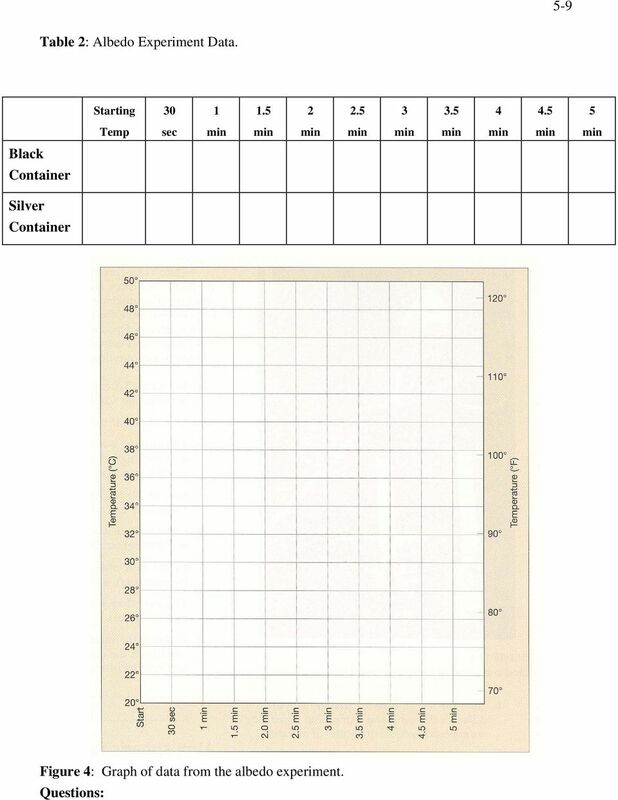 Use a different color line to connect the points for each container. 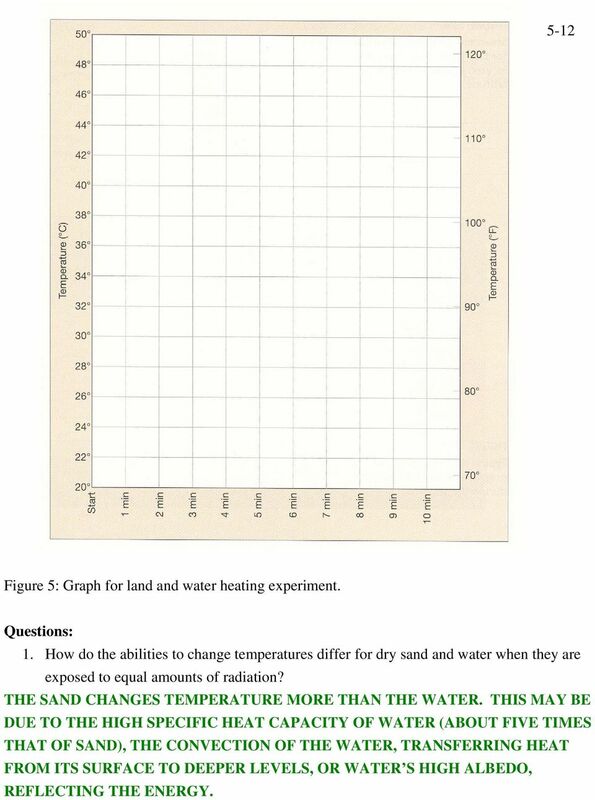 12 5-12 Figure 5: Graph for land and water heating experiment. Questions: 1. How do the abilities to change temperatures differ for dry sand and water when they are exposed to equal amounts of radiation? THE SAND CHANGES TEMPERATURE MORE THAN THE WATER. THIS MAY BE DUE TO THE HIGH SPECIFIC HEAT CAPACITY OF WATER (ABOUT FIVE TIMES THAT OF SAND), THE CONVECTION OF THE WATER, TRANSFERRING HEAT FROM ITS SURFACE TO DEEPER LEVELS, OR WATER S HIGH ALBEDO, REFLECTING THE ENERGY. 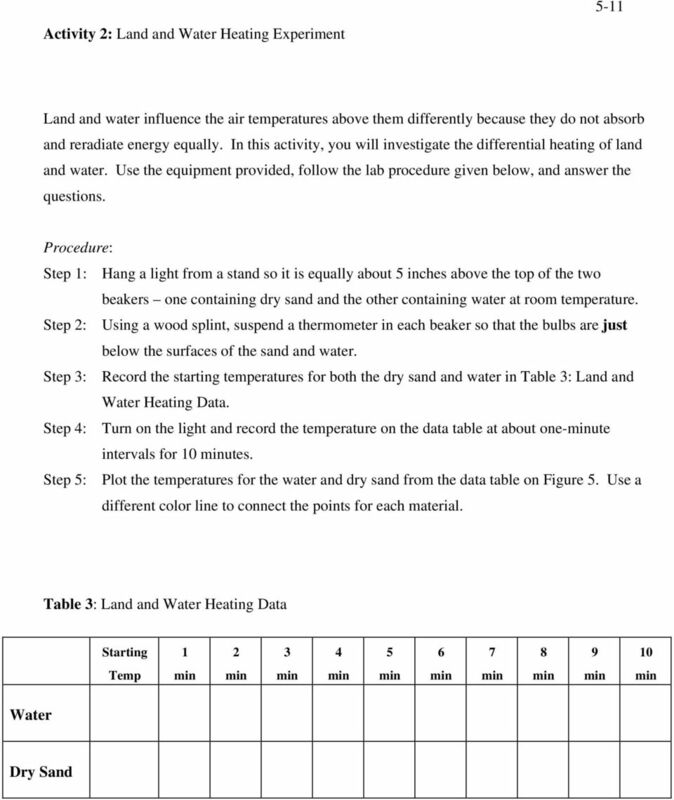 13 List and thoroughly describe two reasons for the differential heating of land and water. THE SPECIFIC HEAT CAPACITY OF WATER IS MUCH GREATER THAN LAND IT TAKES ABOUT FIVE TIMES AS MUCH ENERGY TO CHANGE THE TEMPERATURE OF WATER AS A SIMILAR MASS OF LAND. IN ADDITION, WATER IS FLUID, AND CAN MOVE THE HEAT TO ANOTHER PLACE, WHEREAS THE LAND IS FAIRLY STATIC. ALSO, WATER PROBABLY HAS HIGHER ALBEDO THAN LAND Questions for Further Thought Figure 6 presents the annual temperature curves for two cities, City A and City B, located in North America at approximately 37º-north latitude. On any given date, both cities receive the same intensity and duration of solar radiation. One city is in the center of the continent, while the other is on the west coast. 1. 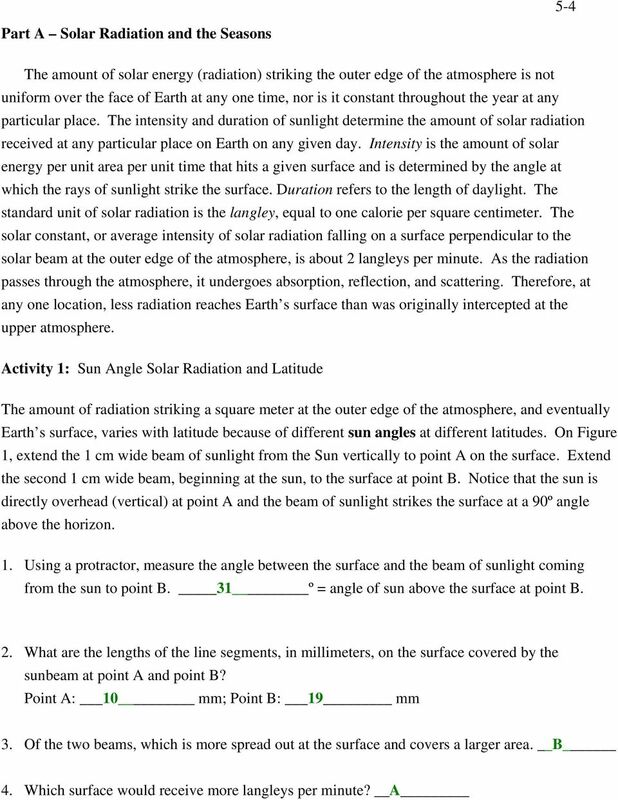 Answer the following questions using Figure 6. a. Over the course of the year, City (A / B) has the highest monthly temperature. b. Over the course of the year, City (A /B) has the lowest monthly temperature. c. The greatest annual temperature range (difference between highest and lowest monthly temperatures) occurs at City (A / B). d. City (A / B) reaches is maximum monthly temperature at an earlier date. e. City (A / B) maintains a more uniform temperature throughout the year. f. Of the two cities, City A is the most likely to be located (along a coast / in the center of a continent). g. The most likely location for City B is (coastal / mid-continent). 2. Describe the effect that location (either along the coast or in the center of a continent) has on the temperature variations of a city throughout the year. MILD TEMPERATURES OCCUR IN COASTAL AREAS, MODERATED BY THE EFFECT OF A LARGE BODY OF WATER. AREAS ISOLATED FROM MARINE INFLUENCE, SUCH AS MID-CONTINENT AREAS HAVE GREATER TEMPERATURE VARIATIONS SEASONALLY AND DAILY, AND CAN BE MUCH COLDER IN WINTER, AND WARMER IN SUMMER, THAN COASTAL AREAS. 15 5-15 Figure 6 Mean monthly temperatures for two North American cities located at approximately 37 N latitude. 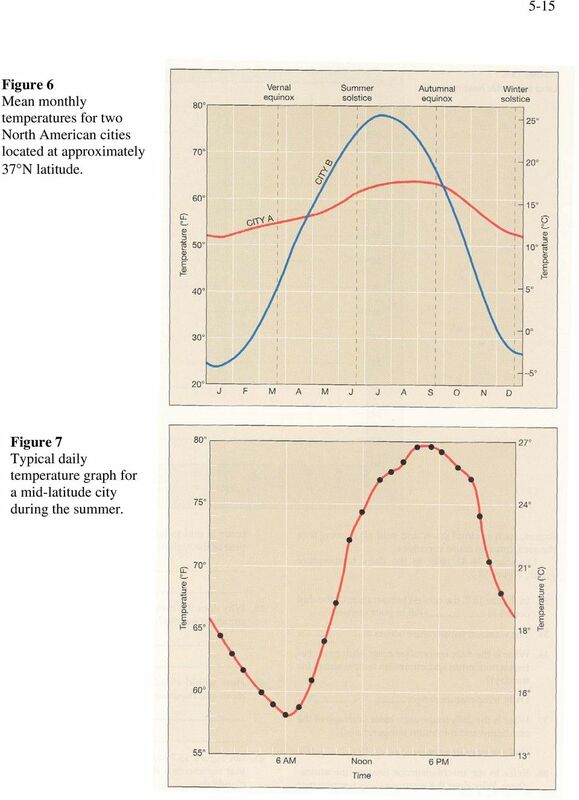 Figure 7 Typical daily temperature graph for a mid-latitude city during the summer. 16 5-16 Name KEY Lab Day/Time POST-LAB ASSESSMENT 1. Imagine that you are designing a house that gets its heat and electricity from solar energy. The house is located in Oregon. A. How would you want to angle the solar collector panels to receive the most energy from the Sun? Would the collectors face north, south, east or west? Would the collectors lie horizontally, vertically, or at an angle? Justify your answers. 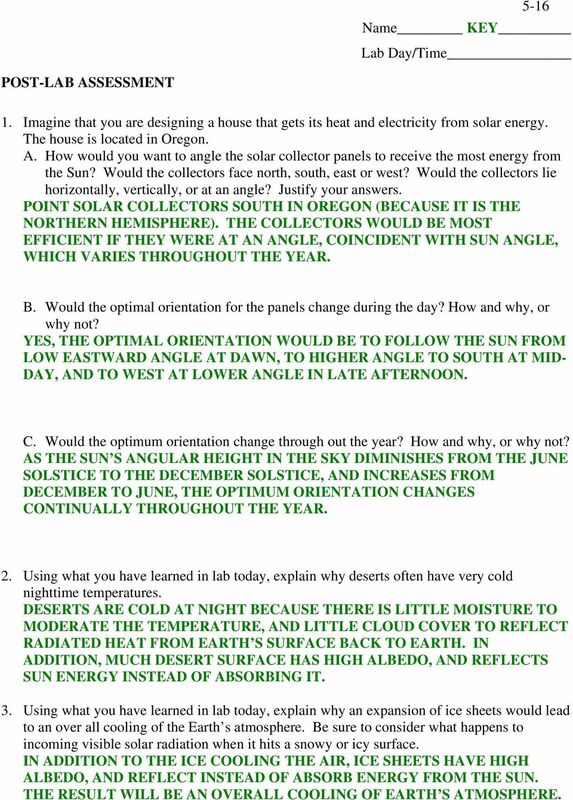 POINT SOLAR COLLECTORS SOUTH IN OREGON (BECAUSE IT IS THE NORTHERN HEMISPHERE). THE COLLECTORS WOULD BE MOST EFFICIENT IF THEY WERE AT AN ANGLE, COINCIDENT WITH SUN ANGLE, WHICH VARIES THROUGHOUT THE YEAR. B. Would the optimal orientation for the panels change during the day? How and why, or why not? YES, THE OPTIMAL ORIENTATION WOULD BE TO FOLLOW THE SUN FROM LOW EASTWARD ANGLE AT DAWN, TO HIGHER ANGLE TO SOUTH AT MID- DAY, AND TO WEST AT LOWER ANGLE IN LATE AFTERNOON. C. Would the optimum orientation change through out the year? How and why, or why not? AS THE SUN S ANGULAR HEIGHT IN THE SKY DIMINISHES FROM THE JUNE SOLSTICE TO THE DECEMBER SOLSTICE, AND INCREASES FROM DECEMBER TO JUNE, THE OPTIMUM ORIENTATION CHANGES CONTINUALLY THROUGHOUT THE YEAR. 2. 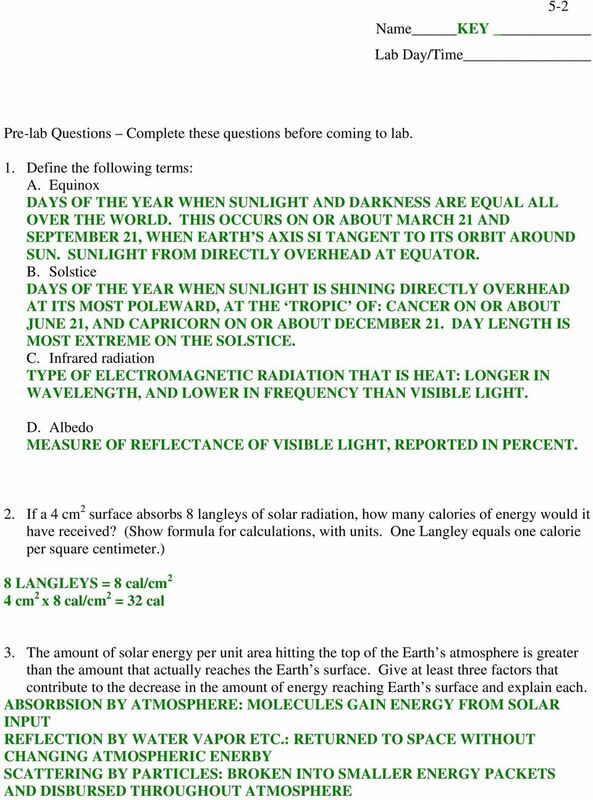 Using what you have learned in lab today, explain why deserts often have very cold nighttime temperatures. DESERTS ARE COLD AT NIGHT BECAUSE THERE IS LITTLE MOISTURE TO MODERATE THE TEMPERATURE, AND LITTLE CLOUD COVER TO REFLECT RADIATED HEAT FROM EARTH S SURFACE BACK TO EARTH. IN ADDITION, MUCH DESERT SURFACE HAS HIGH ALBEDO, AND REFLECTS SUN ENERGY INSTEAD OF ABSORBING IT. 3. Using what you have learned in lab today, explain why an expansion of ice sheets would lead to an over all cooling of the Earth s atmosphere. Be sure to consider what happens to incog visible solar radiation when it hits a snowy or icy surface. IN ADDITION TO THE ICE COOLING THE AIR, ICE SHEETS HAVE HIGH ALBEDO, AND REFLECT INSTEAD OF ABSORB ENERGY FROM THE SUN. THE RESULT WILL BE AN OVERALL COOLING OF EARTH S ATMOSPHERE. 1. 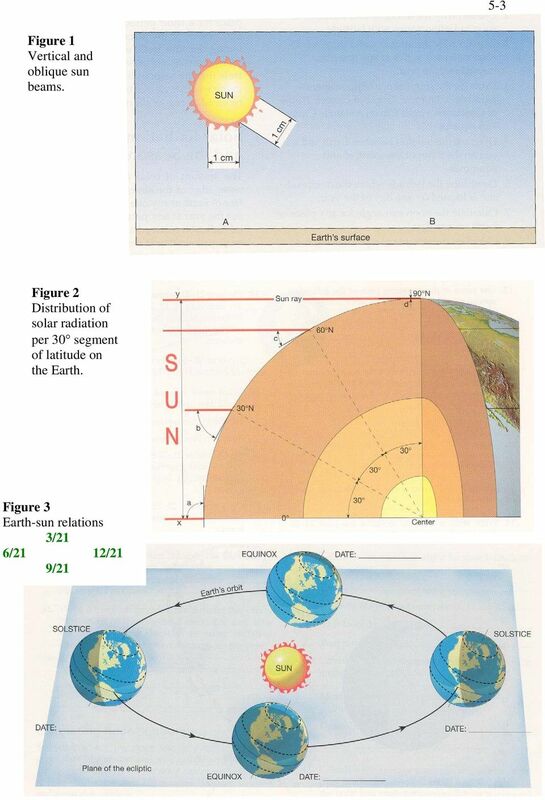 In the diagram below, the direct rays of the Sun are striking the Earth's surface at 23 º N. What is the date shown in the diagram? DETERMINING SOLAR ALTITUDE USING THE GNOMON. How does the altitude change during the day or from day to day? Reasons for Seasons. Question: TRUE OR FALSE. Question: TRUE OR FALSE? What causes the seasons? What causes the seasons?